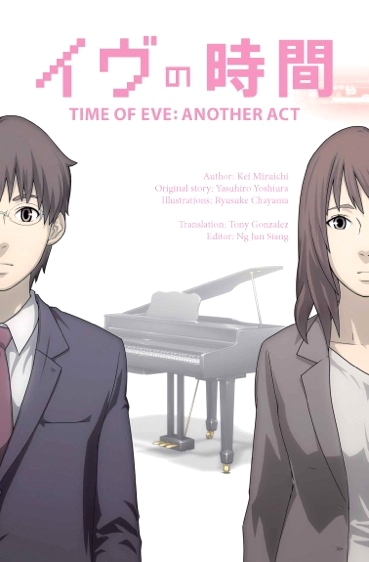 Synopsis: Time of EVE: Another Act explores wrenching emotional conflicts of high schooler Rikuo as he tries to make sense of a world in which androids match humans in terms of intelligence and emotions, and yet they are barred from forming relationships with humans. A mysterious strand of data in the activity log of Sammy, his family’s android, leads Rikuo and his pal Masaki to a cafe called “Time of EVE,” which blatantly challenges social mores by requiring that humans and androids be treated equally. Initially suspicious of the cafe, Rikuo and Masaki soon become regulars as they are charmed by the charismatic proprietress Nagi and get to know the other patrons. In this new environment, Rikuo comes to see to that androids are different from, but not inferior to, humans. And, he is challenged to confront a traumatic experience from his past… This novel is based on Yoshiura Yasuhiro’s classic anime ONA and movie Time of EVE, and became available for overseas licensing thanks to the 2013 Kickstarter campaign to fund the international Blu-ray release of the movie. Note: This light novel was translated and released via a stretch goal for the Time of Eve: The Movie Kickstarter project. It is now available to be purchased on its own through online retailers. It’s kind of difficult to find a copy of this one!